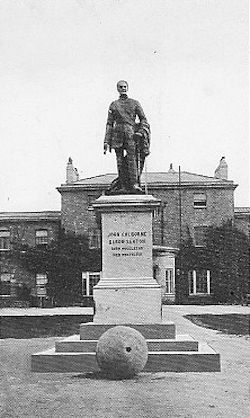 A statue in memory of Sir John Colborne, Field Marshall Lord Seaton of Seaton in Devonshire, was unveiled on Thursday November 29th 1866 by Sir Edmund Prideaux, Bart. Lord Seaton had no direct connection with Devonport, other than being in the British Army. He was born at Lyndhurst, in Hampshire, on February 16th 1778 to Mr Samuel Colborne, a land owner, and his wife, the former Miss Cordelia Ann Garstin. He was educated at Christ's Hospital and Winchester College. He was commissioned as an Ensign in to the 20th Regiment of Foot on July 10th 1794. It is recorded that all subsequent promotions were obtained on merit and not by purchase. His distinguished military career included the Battle of Waterloo, where, under his own initiative, he brought forward his unit, the 52nd Regiment of Foot, to take up a flanking position to the French Imperial Guard, then fired repeated volleys into their flank, and finally charged, forcing them to retreat in disarray. In January 1836 he became Commander-in-Chief, British North America, where in December 1837 he defeated the rebel forces at the Battle of Saint-Eustache. On January 29th 1838 was awarded the Knight Grand Cross of the Order of the Bath by Her Majesty Queen Victoria. Not long after that, on December 5th 1839, he became Baron Seaton of Seaton in Devonshire, where he had intended to set up home. Instead her moved in to Lyneham House, at Plympton, and later still to Beechwood House, in the Ancient Parish of Sparkwell, Devon. He was also awarded an annuity of £2,000 and it was declared that his title would continue to his next two male heirs. After serving as the high commissioner of the Ionian Islands and having been promoted to full General on June 20th 1854, Lord Seaton was appointed as Commander-in-Chief, Ireland in 1855. He retired from active service early in 1860 and returned home to Beechwood House. He was promoted to Field Marshal on April 1st 1860. Lord Seaton, GCB, GCMG, GCH, PC (Ire), died at Valletta House in Torquay on April 17th 1863 but was buried at the Ancient Parish Church of the Holy Cross, Newton Ferrers, Devon. Soon after an appeal for donations from the public was launched to fund a statue of him to be placed at Mount Wise, Devonport. Sculpted in bronze by Mr George Adams, of London, it was duly unveiled by Sir Edmund Prideaux, Bart., on Thursday November 29th 1866. His statue was 8 feet 9 inches tall. The Lord Seaton Memorial was moved from its original position to the west of the parade ground at Mount Wise to in front of Government House at some date and was moved again in the 1960s to the newly opened Seaton Barracks at Crownhill, Plymouth. When that was closed and demolished in the 1990s the Memorial was transferred to the Peninsula Barracks at Winchester, Hampshire, where it can viewed today.